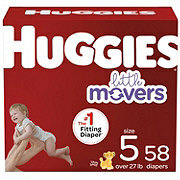 HUGGIES LITTLE MOVERS are designed for active babies. 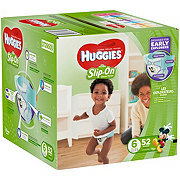 Featuring the latest addition to the HUGGIES MOVING BABY SYSTEM, the SIZEUP indicator, LITTLE MOVERS diapers let you know when it's time for baby to move up to the next diaper size. 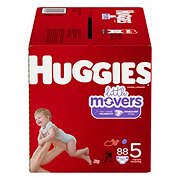 HUGGIES LITTLE MOVERS provide our best fit ever, with a contoured shape for comfort and DOUBLE GRIP STRIPS that hold the diaper in place during active play. Inside, the DRY TOUCH liner absorbs wetness on contact, while the absorbent LEAK LOCK SYSTEM provides up to 12 hours of protection. 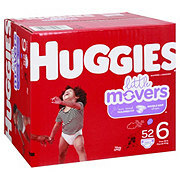 LITTLE MOVERS diapers feature a WETNESS INDICATOR that changes from yellow to blue when wet, so you know when your baby is ready for a change. Important: To avoid risk of suffocation, keep plastic bags way from babies and children. Caution: Choking may result from anything babies might put into their mouths. 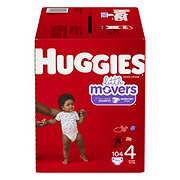 To avoid risk of choking, do not allow baby to tear the diaper. 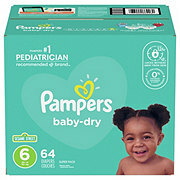 Discard any torn or unsealed diaper. 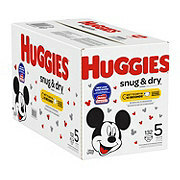 Like most articles of clothing, Huggies diapers will burn if exposed to flame. Always keep your child away from any source of flame.